Hitting a big drive is the equivalent of dropping a nuke on your opponent. Even though there are so many other elements in golf that translate to lower scores, none are as satisfying as outdriving your opponent. 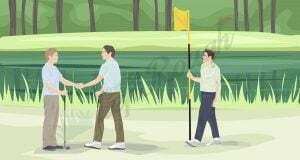 It is a scientific fact that your opponent will soil himself with fear when he realizes you are hitting a 9 iron into the green and he is pulling out a 5 iron. Okay, maybe not exactly. But just like the old 90s Nike commercial said, “Chicks dig the long ball!” Whether it is a homerun in baseball or a 300 yard drive nothing establishes your man-hood like hitting one deep! However, anyone who has ever played golf knows that it is not that easy. For every 300-yard bomb, there are dozens of skulled shots, worm-burners, pop-ups, and tops. Then there are the errant shots that rattle around the trees, pruning limbs, and evacuating woodland critters angrily out of their nest. Thank goodness it is really hard to shank a driver! Those shots at least draw contact compared to ultimate tee box fail, the old “Swing and a Miss” that will have your foursome making fun of you for the rest of the summer. The point is, hitting a driver can be really hard and with a bad tee box strategy your misses can really blow up your scorecard. Why the Driver is different from Irons? Why does it always have to be this way? Some days you are absolutely smoking your driver. You are hitting the ball 300 yards (yeah right) in the middle of the fairway almost every time. As good as this feel is, it feels equally bad when you hit that approach shot out of the fairway and it is either a worm-burner over the green or you dig a hole a foot deep behind the ball. Then there are other days that you are hitting your driver terrible. But you are making excellent contact with your irons out of the woods or the rare occasion you find yourself in the fairway. In fact on those days, you find that your score isn’t that bad even though you’ve seen a lot more of the course than you wanted. Unfortunately, so many beginning golfers realize the difficulty of hitting the driver and irons good on the same day. It’s not a secret that learning how to drive a golf ball is a tough skill to master but what many weekend warriors don’t realize is that the swing you use for your irons is slightly different than what you use with the driver. Yes, you are still trying to hit a golf ball with both club. But the truth is that you are trying to hit the ball in two slightly different ways. For starters, your driver is the longest club you in your bag. The standard graphite driver comes in at 45 inches long with some manufacturers making them even longer. Compare that to a standard 5 iron which is just over 38 inches. Those seven inches make a difference as the longer swing and distance between you and the ball helps expose your swing faults. So with all things being equal, you have a greater margin for error when using your irons vs. your driver. The other major difference between hitting your driver and your irons is that with your driver you want to strike the ball on the upswing, while you want to hit down through the ball with your irons. Consider the divot … you want to take a divot when hitting an iron but a perfect tee shot should send your tee flying down the fairway not a chunk of sod. The very aspect of being able to tee our drives up allows for the club to approach the ball in an upwards sweeping motion. This is important since it significantly affects the “Angle of Attack” on your tee shots. 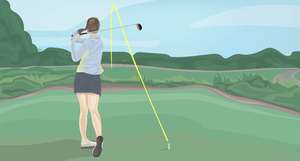 Angle of Attack may sound like a term from the video game Call of Duty, but it simply is a measurement of your club head alignment at impact in relation to the horizon. 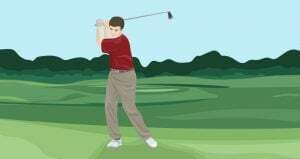 A shot in which the club head strikes the ball perfectly perpendicular to the horizon would be 0 degrees while shots with the club head facing slightly toward the ground at have a negative angle of attack and shots with the club head slightly facing skyward have a positive angle of attack. The opposite is true when learning how to drive a ball as you want your tee shot to have a positive angle of attack to help launch the ball off the tee and into the air. TrackMan technology used by almost all professional golfers today has also analyzed amateur golfers driving the ball and found a direct correlation between handicap and attack angle: scratch golfers were near zero on drives from the tee, while on the other end of the scale, bogey golfers had a minus 2.1 degree Angle of Attack on tee shots. So the goal is to hit your tee shot on the upswing and that will result in maximum ball flight which will translate into more distance and carry. Most mid-to-high handicappers that currently hit the ball at a negative attack angle or flat angle will need to change the way they set up in order to achieve a positive angle of attack. It starts with where and how you tee the ball up. 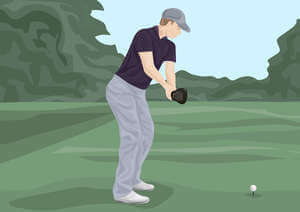 Basically, you want to tee the ball higher than you normally do and you want to put the tee further up in your stance. Tee it up high enough so that the bottom of your ball is slightly above the top edge of your driver. When looking down at address, the entire crown of your driver should be below the ball. Folks who have studied this for a living such as Pinehurst, N.C. golf teacher Eric Alpenfels and Bob Christina, Ph.D. from UNC-Greensboro, have found that balls teed in a high position vs. mid tee (half the ball above the crown) or low tee height (entire ball below the crown) result in not only longer distance but more fairways hit. Bottom line, tee it up high. If you have been playing golf for some time you might have been instructed to play the ball just inside your left leg. However, for best results we recommend that you tee the ball off the left shoulder to ensure that you achieve a positive angle of attack. Visually you don’t want to see the ball at address inside your left leg but lined up with your left big toe instead. One thing to keep in mind, the left armpit normally represents the lowest point of your downswing. So regardless of where you decide to tee up the ball, realize that teeing up anywhere behind the left armpit will mean the bottom of your swing is after the ball. Keeping in mind that tweaking your Golf swing is a bit like putting together a puzzle – every little move affects everything else! We now have to make sure your stance accounts for the ball being teed forward. 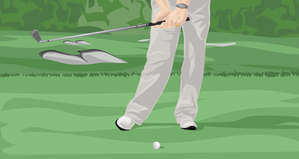 If you haven’t thought about your golf stance, it can be broken down into three boxes: a square stance in which both feet are parallel to the ball; an open stance in which your left foot is moved a few inches away from the ball; and a closed stance in which your right foot is moved a few inches away from the ball. Because you are now playing the ball in an extremely forward position, if you use a square stance your natural club path will be slightly inside to out. That’s the opposite of what we want in order to optimize distance and attack angle! To compensate for this, we recommend that you use a slightly closed stance on your tee shots, right foot back away from target, as this will help produce an inside-to-out swing and should facilitate hitting the ball on the upswing at impact. The closed stance also helps by naturally starting your hip and shoulder rotation and it will force your hands slightly ahead at impact. Finally, one last thing before we start our new-and-improved swing: tilt your spine away from the target. Your back shoulder should now be a little lower than your front shoulder. Now that we have our setup ready to go, it’s time to get swinging. Golf can be an incredibly mental game – we’ have all missed the “gimme putt” under pressure that the average toddler holes easily on the putt-putt course – so during the swing we don’t want to cram your head with a thousand technique nuances. Our starting point can be what we don’t want in a swing which is the typical high handicapper tee shot that comes from over the top of the ball and is in a motion sweeping from the outside to the inside of the ball. This is the result of the swing length swing due to club length. Instead, you can focus on hitting the ball from the inside and keeping your head back on the downswing. Remember that our closed stance is already helping with hitting the ball inside-out, but it can help to focus at impact of not hitting the ball dead center but slightly to the left or inside of the ball. Also, you probably have been taught to keep your eye on the ball throughout your swing – adage many a Little League baseball player have heard as well! 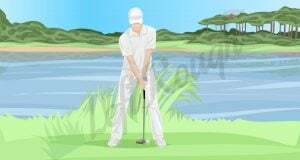 But it can help to pick a focal point slightly at the back of the ball to look at. Once you have that focal point, keep looking at it during your swing as this will keep your head back and that will help maintain that spine tilt we started with at address. By looking slightly back of the center of the ball we are also promoting the chances of you staying behind the ball and making impact on the upswing. Okay, so you think you have the driver figured out now? 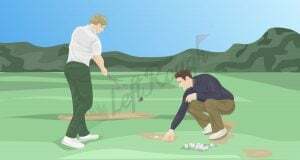 However, you can have the proper set-up, the right address, the perfect swing thoughts and still be picking ticks off your socks as you hunt for your ball in the tall grass or The Left Rough. Yes, that class you might have survived by copying somebody else’s homework. But golf really is about physics and physics teaches us that the lower the loft you have on a shot the more the ball will tend to curve. The driver is the lowest lofted club in your bag and creates the most ball speed. That combination is why it is difficult for the average golfer to keep tee shots in the fairway. Shots hit with the driver, by nature, tend to stray off to a greater degree than shots hit with lower speeds with lofted irons. 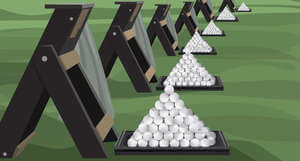 Physics also shows us that tee shots with a downward Angle of Attack will result in a ball with a very high spin rate. When the ball spins too much it creates a shot that has trouble maintaining its line and staying in the fairway. The last piece of the puzzle is the face-to-path ratio. This positive or negative number tells us how open or closed the club face is in relation to the club path of your swing. Saving you time of hunting down your slide rule, we can tell you if your face-to-path ratio is positive (club face open) at impact then the ball will curve right and the opposite is true with a negative (club face closed) shot resulting in a curve left. How important is this face angle? Experts think it accounts for 75-to-85 percent of a ball flights starting direction and, if your drives tend to have a slower ball speed then the face angle accounts for almost 100 percent of your ball direction. The more that your club face is open or closed to the swing path, the more your shot will curve right or left of your intended target. If you can gain an understanding of your natural face-to-path ratio, then you can adjust your tee shots to stay on line and even begin to think about utilizing a planned fade or draw to improve your tee shots. We’ll cover the ball flight laws in a later post, but just remember that the club face at impact with a driver will determine the ball’s starting direction. Even if you understand the physics of golf, it can still be complicated! One of our favorite golf stories is told in John Derr’s book “My Place at the Table” and involves the greatest physicists of all time, Albert Einstein. 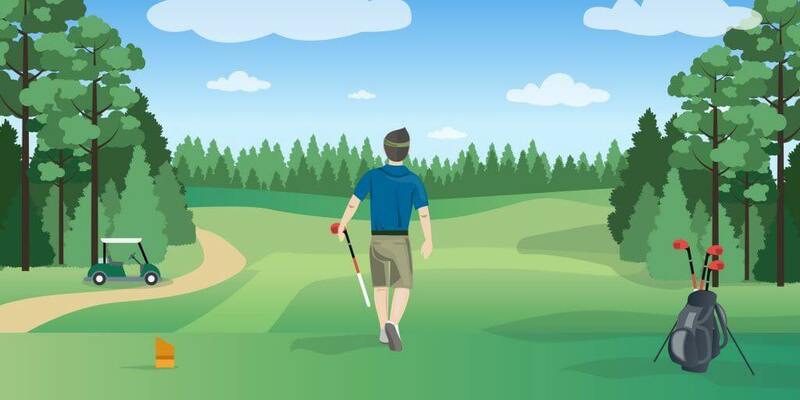 Unlike Mr. Einstein did, you are not about to give up the game of golf and with the adjustments we talked about you could, in theory, be relatively on your way to longer – and even straighter – drives off the tee. We are not promising that you will be getting your tour card next month. If golf was that easy, it would be called bowling. But maybe with a little understanding, you won't be afraid to throw some cash in the Saturday morning Nassau. If you concentrate on a positive Angle of Attack on your tee shots by utilizing a proper set-up, address and good swing mechanics then you are going to get extra distance starting today. Combine that with understanding your face-to-path ratio at impact and you will be on the road to receiving more than your usual share of fist bumps off the tee. Now that you know how to properly use the weapon we call a driver, go get your hands on a new one. Thanks Lex! Sometimes in the quest for improving we lose sight of the basic fundamentals.